A small antique dining table, repurposed as my writing table, sits by a large window in the breakfast room. The cherry wood has a smooth rich patina ripened by age and signed by watermarks from a continual parade of tea cups, coffee mugs, flower pots, and leaky bud vases. Out the window, the arborvitae along the fence line sway in the breeze like a happy gospel choir. Sunlight from the east plays with leaves hanging on high branches; light darts in and out between the green like a hummingbird searching for nectar. 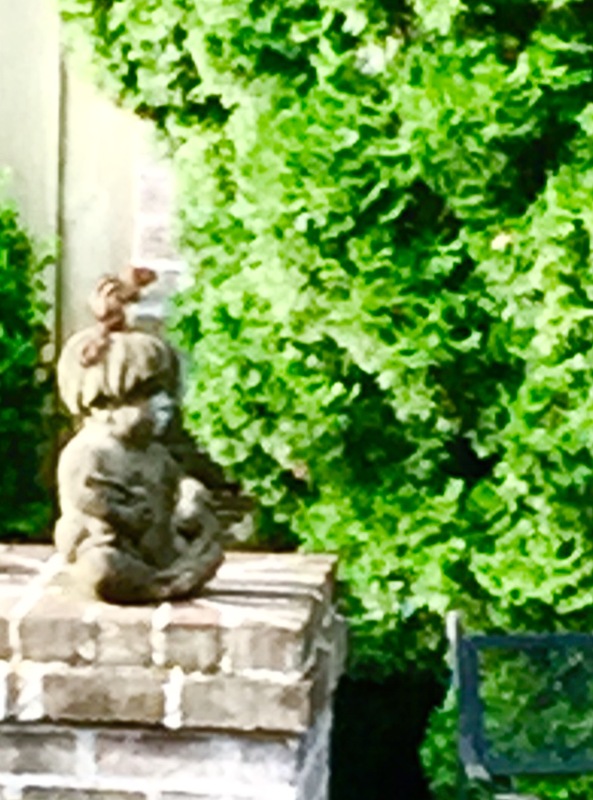 The sudden appearance of a chipmunk perched on the head of my garden statue—the sculpture of a little boy sitting cross-legged with a rabbit in his lap—startles me. I gasp. 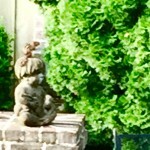 The chipmunk’s bushy tale drapes down the side of the little boy’s head like a furry hat. The animal blends into the concrete. A still life. 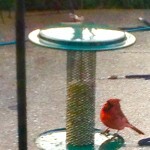 Cardinals, sparrows, and house finches engage in a noisy flurry at the birdfeeder. With an abrupt turn of his head, the chipmunk pauses, perks up like a meerkat, and scampers into the low-lying shrubbery. 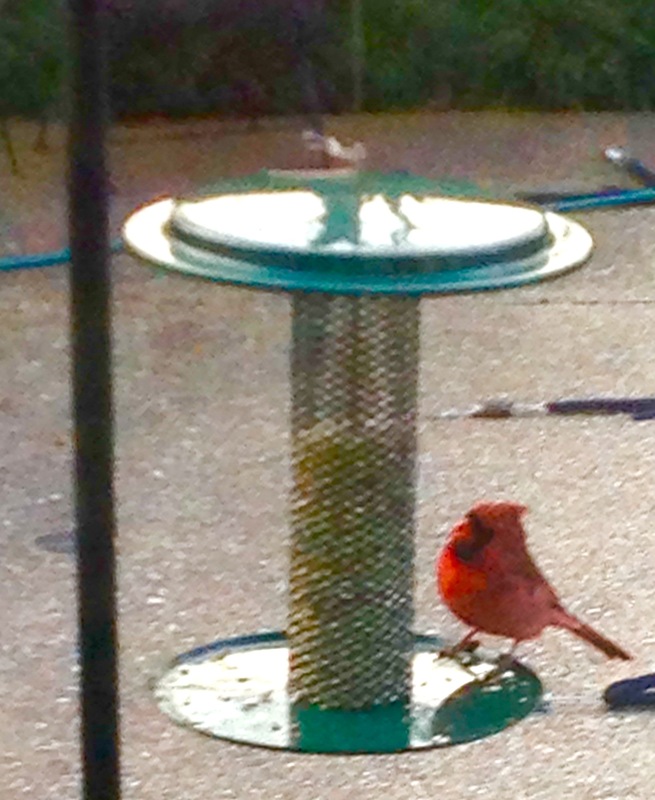 A male cardinal, proud and red, with a wisp of red plumage atop his head, wins the battle for position at the feeder. His female counterpart is thin, grayish, and pale. He—I named him D’Artagnan after the most valiant of Dumas’ characters in The Three Musketeers—pecks at the safflower seed in the hanging wire silo, captures a seed in his mouth, cracks it with his sturdy beak and passes it to his lady, like a lover giving a gentle kiss to his beloved. With a swoosh, Mae West, a round-breasted mourning dove, alights on top of the feeder, causing it to sway as she sashays about with her full bustle. Because of their size, the doves hold the keys to the coffer of seeds. They make merry and dine and grow bloated with time. There are no leftovers. Not one crackle. In early 2013, I was diagnosed with cancer. My world went still, folding in on itself like useless bellows. The chemotherapy I received was a benevolent poison; while killing the unhealthy cells, it attacked healthy cells, also, resulting in extreme fatigue, an inability to concentrate, and a weakened immune system. Words became hazy on the page of a book; it was hard to read a whole paragraph and understand it. The computer screen’s light altered my vision; tears salted my cheeks. It was as if someone had stuck me in a tightly bound book, slammed it shut, and shelved it. My husband installed birdfeeders in our backyard outside the breakfast room window. He stocked them with thistle seed and safflower. Every morning, I crept toward the kitchen, grimacing when the old wood floors creaked, hoping not to scare away my first visitor. A study in red—D’Artagnan—was perched at the feeder one morning as I tiptoed around the corner from the den. On subsequent mornings, brilliant goldfinches, chickadees, tufted titmice, and doves arrived. The rare appearance of indigo buntings and a rose-breasted grosbeak—his chest splashed with red like blood from a dagger wound—pulled me from my chair. Adam must have felt the weight of words when God said: Name them. I sat down. With a shaky hand, I scrawled fragments of sentences in my journal. A small young dove slow-steps along the brick window sill. As I rest my elbows on the table, its old joints creak. The bird stops, turns his slick gumball head, considers me with his black bead of an eye, and with his slender beak commences a gentle tapping on the glass. Tap. Tap. Tap. He is not looking at me, but at his own reflection wrought by the play of light on the glass making a mirror image of himself. His kinfolk arrive and with a whistling of his wings, he shoots away to the trees. My blank computer screen stares at me. 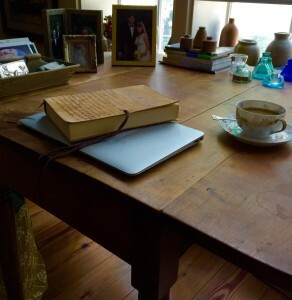 My journal is open beside me on the table. I begin to type: In early 2013, I was diagnosed with cancer…. This entry was posted in Creating Place and tagged backyard birds, cancer, creating, creation, isolation, journal, nature, writing. Bookmark the permalink. Your words never fail to touch me deeply. Please keep writing. Your description of the effects of chemo sounds so much like a day in the life with ME/CFS. When I first got sick the bird feeder in upstate NY where I lived was my lifeline to the world, too, though I never named the D’Artagnans and Mae Wests who visited. Keith Jarrett used to call them “hummingbird days”–the ones where all you can do is watch the feeder. All by way of saying, I hear affirmation of my experience in your words. I hope you hear affirmation of yours in mine — that big, deep, “I know, my friend.” Which is as close as I can come to giving you a hug from this distance. Stacy, thank you for your gracious words. Yes, I think of you, often: the ways in which your disease confines you in all aspects of your life. Perhaps, the most difficult/ infuriating aspect is our society’s and medical establishment’s attitudes. Please know you have a friend who admires you and fights for you when the opportunity arises. It pleases me to know you are affirmed by my words. A big hug back to you from across a river or two. Keep swimming, even though it feels like an up-stream endeavor. loved reading our short story. I am ready for one of your books to buy! Thank you for reading and commenting, Jo Anne. I appreciate your support! Beautiful piece. Thank you for writing and sharing it with us, Lisa. Thank you for reading my words. I am honored by your support.